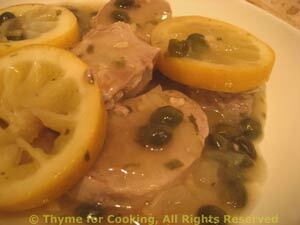 Pork Tenderloin with Lemon, Capers, Thyme for Cooking quick, easy gourmet. Pork tenderloin lends itself to a variety of treatments; it's lean, cooks fast and stays moist and tender. I can get them under a lb which is perfect for us. You could substitute boneless pork chops if you like. Slice the lemon, remove pips. Thinly slice the shallot and finely chop the garlic. Slice the tenderloin into 1 inch (2.5 cm) thick slices. Sauté shallot and garlic in oil in nonstick skillet over medium-high heat. When shallot starts to brown, move it to the sides of the pan and sauté pork medallions for 5 minutes per side. Add tarragon, stock, white wine and capers to pan. Lay lemon slices on top of pork medallions. Cover, reduce heat to low and simmer 15 minutes. Uncover skillet, and remove pork medallions, with lemon slices, to a small platter. Increase heat, add cornstarch and stir until sauce is thickened. Spoon some caper sauce around the pork and serve, remaining sauce on the side.